You can truly "eat the rainbow" with this delicious Southwestern Salad topped with a quick and easy homemade avocado dressing. It’s the new year, and we are trying to eat healthy after the indulgence of the holidays. Our recent grocery trip included a lot of fresh fruit and vegetables and wonderful intentions! Now we just have to make sure to eat everything before it goes bad! Typically, a salad for us is just a grilled chicken salad, or a large house or greek salad. But those can get boring after a while, so I always keep on the lookout for a new salad recipe to try. I recently downloaded the Tasty app and found this delicious-looking southwestern salad so decided to give it a try. Now, anyone who knows me knows that I am not big on vegetables. But I am trying. I’ve noticed that a lot of them are an acquired taste, so I just keep forcing myself to eat them and have slowly gotten used to a few. Vegetables will never be something I love, but I can tolerate quite a few of them. The southwestern salad is stocked full of vegetables. You definitely are “eating the rainbow” with this meal. And because there is so much goodness in it, the salad is filling enough to be a meal in itself. 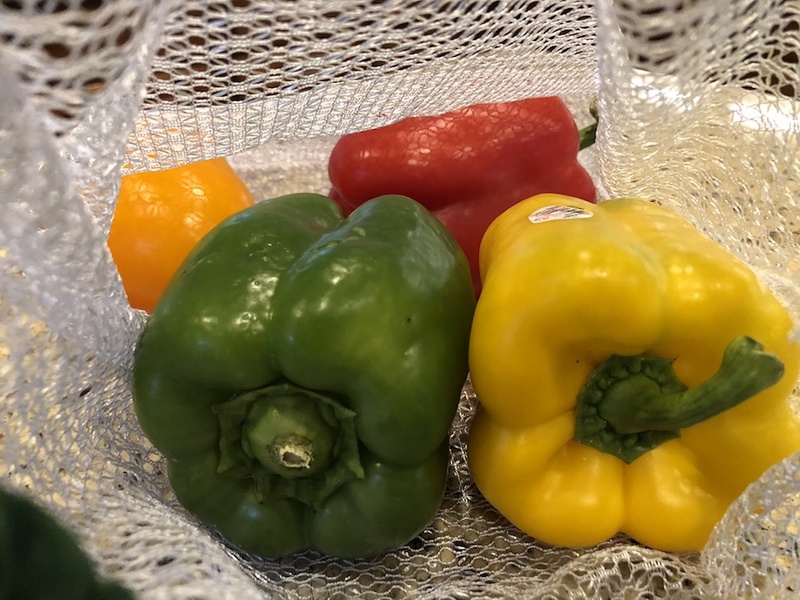 Just look at those beautiful bell peppers! We used one of every color in our salad. And we are doing our part to lower our plastic consumption by using some mesh reusable produce bags at the store rather than the plastic ones they offer. I didn’t take too many step-by-step photos for this recipe since it’s a fairly simple one. Start by chopping up all of the vegetables. We used a small amount of each pepper, as well as some tomato and onion. (We used the rest of the peppers the next night to make Mongolian Beef Stir-Fry so there wouldn’t be any waste.) The recipe called for corn, and I had some frozen corn in the freezer already, so I just heated that up for it. The original also suggested black beans but, much to Justin’s dismay, I didn’t add any since I don’t like them. He said it would definitely help the flavor so we will next time and he will add his at the end. To make the avocado dressing, add all of the ingredients in a blender and puree. I like to use the magic bullet since I am not making a huge amount and it’s easier to clean. Once you have all of the veggies chopped and the dressing made, the last thing to do is put it all together. Start by filling your bowl with lettuce, then add the peppers, tomato, onion, corn, and black beans (if you are using them). Top with s bit of chopped green onion, and drizzle the avocado dressing over it all. Then toss the salad and serve! You can truly “eat the rainbow” with this delicious Southwestern Salad topped with a quick and easy homemade avocado dressing. I dont know if its because the air is more dry in the winter, but I have been craving salads so much! This looks awesome- PLUS, I have been obsessed with avocado dressing since I discovered it! This was the first time I had an avocado dressing! It’s fun to experiment and make our own dressings sometimes. It really does! I love seeing all the colors together too, it looks so pretty! We eat salads here often but I don’t usually make my own dressing. I think the salad my husband got last night he got avocado dressing on. So this may be worth trying out! I’ve only tried to make a few dressings myself, and it’s fun for something a little different. This recipe is so fresh and colorful. I eat avocado with everything, now I have your avocado dressing, it will be on everything. Yes, I love the colors! I hope you like the dressing, it was so easy to make! I’m so picky about vegetables, it makes me feel childish. That being said, the avocado dressing looks amazing and I want it on everything. I am picky on my vegetables as well. I just started forcing myself to eat them in the last year. I figure it’s hypocritical to make my boys eat them when I don’t! This looks and sounds so good! I really do need to eat more salads. I don’t very often, so when I do, it bothers my stomach. It’s probably saying what the heck is this healthy stuff?! Lol! Haha, too funny! It could be the type of lettuce or dressing too. I can’t stand Caesar dressing because of the anchovies in it, they turn my stomach. I love veggies but I have a had time making them interesting enough to eat, if that makes sense. This looks so good, definitely will have to try it! It makes sense, I know exactly what you mean. I don’t like veggies on their own, they have to be seasoned or cooked into something, or covered in a dressing like this! I love a good salad and this one looks so healthy and colorful. Yum! That’s my favorite part, all the colors! Oh I bet that would be delicious! I’ll have to try it next time, my husband would be all for that idea!! This really does look delicious. I am sure I would love the good avocado dressing. Avocado does seem to make everything better. The avocado dressing is what made this so yummy! I’ve been putting them on more and more lately. This looks really good, I never thought about making something like this. I love everything you put in the mix, so I am going to definitely have to try this! It looks so easy to make to and sounds so delicious. Thanks for sharing! It is so easy. The thing that took the longest was slicing up all the peppers! Oh this salad sounds amazing. I lwould ove to try this out for my dinner tomorrow.